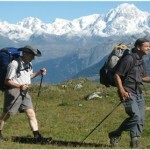 It does not stop on properly choosing the right walking pole for a person to gain the best out from walking poles. Being able to choose the perfect walking pole is just the start. 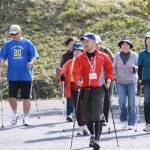 Once you have chosen the right and perfect walking pole according to the user’s walking capability, needs, and how the user is going to use it, the next thing to do is to know the right way on how to properly position walking poles during various walking activities. 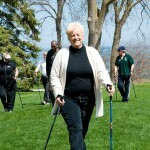 Since walking poles are usually used to add balance and improve stability of users, especially for seniors who are going to do various walking activities, it is very important to know the proper positioning of walking poles to gain walking poles’ advantages. 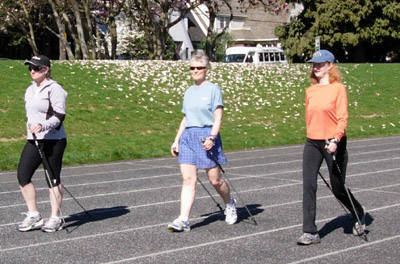 Walking with walking poles, also known as trekking poles can also increase exercise or workout intensities. Using walking poles will relieve too much work and pressure to the lower extremities by putting the upper body to work. Aside from relieving pressure, walking poles can even absorb the impact while walking, thus reducing impacts to sensitive joint muscles in sensitive lower extremities. As more muscles in the upper body are involved in walking while using walking poles, it can increase a person’s heart rate, thus increasing the number of burned calories. 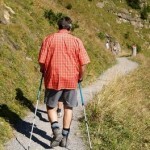 When used the right way, walking poles will really be beneficial to any of its users. Here, I will provide easy steps on how to correctly position walking poles. Wear the strap and wrap your hands comfortably on the rubber grips of the walking pole. You have to make sure that your hands are comfortably positioned on the rubber grips since each rubber grip is specially designed to fit user’s hands perfectly. In positioning walking poles, make sure that the knuckles of both your hands are facing in front, not sideways, but in front. Slowly place the bottom tip of the walking pole to the ground. Preferably, when the bottom tips of waling poles are already on the ground, elbows should be at least on a 90 degrees angle. If the height of the walking poles is not comfortable, adjust it. Proper measurement (height) of walking poles is also very important. 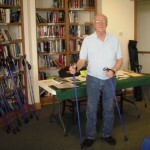 Once proper measurement and adjustments are done, you can now start walking using your walking poles. As your left foot steps forward, the right walking pole should be parallel to the heel or ankle of your left foot, while the left walking pole should be in lined with your body and vice versa.